Motet Cycles between Devotion and Liturgy, ed. by Agnese Pavanello and Daniele V. Filippi, Basel: Schwabe (2018). Codici per cantare: I Libroni del Duomo nella Milano sforzesca, ed. by Agnese Pavanello and Daniele V. Filippi, Lucca: LIM (2018). Luca Marenzio, Il sesto libro de madrigali a cinque voci (1594). MODE – Marenzio Online Digital Edition. Mapping the Motet in the Post-Tridentine Era, ed. by Esperanza Rodríguez-García and Daniele V. Filippi, Abingdon-New York: Routledge (publ. September 2018, © 2019). Mapping the Motet in the Post-Tridentine Era provides new dimensions to the discussion of the immense corpus of polyphonic motets produced and performed in the decades following the end of the Council of Trent in 1563. Beyond the genre’s rich connections with contemporary spiritual life and religious experience, the motet is understood here as having a multifaceted life in transmission, performance and reception. By analysing the repertoire itself, but also by studying its material life in books and accounts, in physical places and concrete sonic environments, and by investigating the ways in which the motet was listened to and talked about by contemporaries, the eleven chapters in this book redefine the cultural role of the genre. The motet, thanks to its own protean nature, not bound to any given textual, functional or compositional constraint, was able to convey cultural meanings powerfully, give voice to individual and collective identities, cross linguistic and confessional divides, and incarnate a model of learned and highly expressive musical composition. Case studies include considerations of composers (Palestrina, Victoria, Lasso), cities (Seville and Granada, Milan), books (calendrically ordered collections, non-liturgical music books) and special portions of the repertoire (motets pro defunctis, instrumental intabulations). The Soundtrack for a Miracle and Other Stories of the Motet from Post-Tridentine Milan, in Mapping the Motet in the Post-Tridentine Era, ed. by Esperanza Rodríguez-García and Daniele V. Filippi, Abingdon-New York: Routledge (publ. September 2018, © 2019), 228–49. from the Intro by the editors: Filippi’s chapter looks at the role of the motet in the musical, ritual, and cultural life of Milan in the decades immediately after Trent. The genre emerges here, on the one hand, as an element of the spiritual entertainment that Archbishop Carlo Borromeo aimed to provide to the faithful during religious meetings (often in combination with sermons) as a tool to foster devotion and encourage participation. On the other hand, the motet is presented as a highly significant sonic ingredient in confraternal, civic, and political events. The author reports highly charged sensorial descriptions of occasions involving motets, such as those regarding the attempted murder of Borromeo (that include sonic elements such as Lasso’s motet Tempus est ut revertar, the singing of angels, and the weapons’ aural imagery). He also examines the role of the chapel of the Milanese Duomo in the development of new motet-related musical practices and genres, such as the transformative performance of polyphonic motets with embellishments and diminutions, and the creation of the canzona-motet. Songs in Early Modern Catholic Missions: Between Europe, the Indies, and the “Indies of Europe” , in Vokalpolyphonie zwischen Alter und Neuer Welt: Musikalische Austauschprozesse zwischen Europa und Latein-Amerika im 16. und 17. 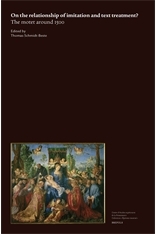 Jahrhundert, edited by Klaus Pietschmann, Troja – Jahrbuch für Renaissance-musik 14, Kassel: Bärenreiter, 39-67. Abstract: “More than for the preaching, [the natives] convert for the music”, the first bishop of New Spain famously wrote to Emperor Charles V in 1540. European missionaries were quick to realize that music was a powerful tool for establishing a connection with the natives, and pave the way for their conversion. In this chapter I discuss the interrelation between song, memory, and language in early modern missionary methods. I also reflect on how the growing body of evidence regarding the use of songs in extra-European missions can affect our understanding of parallel phenomena on European soil. In particular, I show how methods involving the use of songs in order to teach the catechism travelled on the triangular route between Europe, the Indies, and what became known as “our Indies” (“le nostre Indie” or “las Indias de por acá”: missionized areas on European soil). ‘Audire missam non est verba missae intelligere…’: The Low Mass and the ‘Motetti missales’ in Sforza Milan, in «Journal of the Alamire Foundation», 9/1, 2017, 11-32. Abstract: In order to provide a new theoretical basis for reassessing the late fifteenth-century motetti missales and their interaction with liturgy in Sforza Milan, this paper starts not with the missales specifically, but rather with the broader issue of ‘hearing the mass’. This precept was central to the life of early modern Christians, but in how many ways could the faithful fulfil it? How many forms of attention and participation were deemed acceptable? What role did sonic elements play in it? And conversely, how did these conceptions influence musical choices? Through the study of treatises, methods, and other documents, the first sections of the paper explore the theory and practice of attending mass and examine problems such as the synchronization between ritual actions, individual devotion, and collective experiences. Focusing back on the motetti missales in light of the background thus delineated, I argue that the motetti missales were performed during votive low masses. In the conclusions, I put this practice in the perspective of the early modern era and suggest that the low mass may have been an important venue for the performance of motets throughout the period. 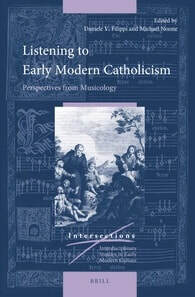 Listening to Early Modern Catholicism, ed. by Daniele V. Filippi and Michael Noone, Intersections, Leiden: Brill, 2017. How did Catholicism sound in the early modern period? What kinds of sonic cultures developed within the diverse and dynamic matrix of Early Modern Catholicism? And what do we learn about Early Modern Catholicism by attending to its sonic manifestations? Editors Daniele V. Filippi and Michael Noone have brought together a variety of studies — ranging from processional culture in Bavaria to Roman confraternities, and catechetical praxis in popular missions — that share an emphasis on the many and varied modalities and meanings of sonic experience in Early Modern Catholic life. Contributors are: Egberto Bermúdez, Jane A. Bernstein, Xavier Bisaro, Andrew Cichy, Daniele V. Filippi, Alexander J. Fisher, Marco Gozzi, Robert L. Kendrick, Tess Knighton, Ignazio Macchiarella, Margaret Murata, John W. O’Malley, S.J., Noel O’Regan, Anne Piéjus, and Colleen Reardon. For a shorter version of this video, see tinyurl.com/ListeningEMC. “Catechismum modulans docebat”: Teaching the Doctrine Through Singing in Early Modern Catholicism, in Listening to Early Modern Catholicism, ed. by Daniele V. Filippi and Michael Noone, Intersections, Leiden: Brill, 2017, 129-148. Abstract: Despite the relative lack of scholarly attention, the use of vernacular songs to teach the catechism was responsible for one of the most prominent sonic features of early modern Catholicism. The method was employed, in countless variants, from Sicily to Brazil, from Castile to Japan, in a longue durée from the first decades of the sixteenth century to the end of early modernity and beyond. Its essential mechanics are not difficult to explain: the doctrine was condensed into uncomplicated formulae, set to easy tunes, and taught by means of repetition; the learners (chiefly “youngsters, children, ignorant and unrefined people, countrymen, and women”) memorized the doctrine and spread it abroad with little effort. Although simple and aesthetically unassuming, these musical practices are interconnected with some of the most stimulating issues of contemporary Catholicism. Their study has much to reveal about problems as diverse as the working of local and international Catholic networks (most notably that of the Jesuits), the role of songs and sonic media in interconfessional encounters, and the interplay between missionary experiences in Europe and in extra-European lands. Sonic Afterworld: Mapping the Soundscape of Heaven and Hell in Early Modern European Cities, in Cultural Histories of Noise, Sound and Listening in Europe, 1300-1918, ed. by I.D. Biddle and Kirsten Gibson, London-New York: Routledge, 2017, 186-204.
from the Intro by the editors: In Chapter 9, Daniele V. Filippi explores the ways in which Biblical notions of ‘otherworldly’ sound – both heavenly and hellish – were echoed in the Cathedrals, churches, squares and streets of early modern Italian cities, giving their citizens a sensory, aural foretaste of the afterlife. Drawing on the writings of Luis de Granada and Jeremias Drexel, Filippi outlines the aural dimensions of early modern understandings of the afterlife, and, in particular, the status of music in the heavenly sphere. These ideals, as Filippi shows, were drawn on and evoked in earthly urban life, in both liturgical and secular art music practices, in the aural dimensions of the daily cycle of worship, in the architectural planning of sacred spaces and in the ceremonies and processions of urban feast days. Aural evocations of hellish soundscapes could also be heard in the streets of Italian towns and cities, though to a lesser extent than the heavenly, but, as Filippi observes, such evocations were to be found on the stage, playing an important role in some of the earliest operas at the beginning of the seventeenth century. Retrieving the Sounds of the Old Society: For a History of Historiography on Jesuits and Music, in Jesuit Historiography Online, ed. Robert A. Maryks, Leiden: Brill, 2016 [open access]. “Their Sound Hath Gone Forth into all the Earth”. Music and Sound in the Ministries of Early Modern Jesuits, «Journal of Jesuit Studies» 3/3 (2016) [open access]. Guest editor: Daniele V. Filippi. Abstract: The present collection of studies aims to explore how music and sound worked as tools for the ministries of early modern Jesuits. In spite of well-worn clichés, the Jesuits abundantly used music and sound (inside and outside the liturgy) for purposes that covered the full spectrum of the classical threefold motto: docere – delectare – movere (to teach, to delight, and to move). Music and sound helped the Jesuits convey their religious message, interact with different cultures and social strata, and establish collective identities. They were tools to attract and entertain people, to reshape habits, and even to redefine perceptions of time and space. Whereas musicology, as a discipline, has been relatively slow to acknowledge the potential of this field of study, the time is now ripe for a re-assessment of the relationship between Jesuits and music, and for a fuller understanding of how this relationship worked in different contexts. In line with the wide-ranging character of Jesuit studies, the present collection of essays gathers together a diverse team of musicologists from different career stages and backgrounds, and from six countries in three continents. Their works cannot represent anything but a part of the varied research perspectives currently adopted in musicology and related fields. Still, what readers will find in the following pages aims at exemplifying a variety of approaches and providing stimuli for both disciplinary and interdisciplinary reflection. 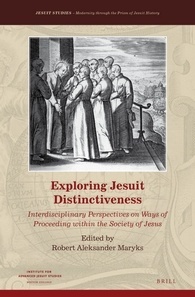 The various essays investigate different activities, locales, and cultural objects, highlighting the dynamic nature of Jesuit networks in the longue durée perspective of the early modern era. “Ask the Jesuits to Send Verses from Rome”: The Society’s Networks and the European Dissemination of Devotional Music, in Exploring Jesuit Distinctiveness: Interdisciplinary Perspectives on Ways of Proceeding within the Society of Jesus, ed. Robert A. Maryks, Jesuit Studies 6, Leiden: Brill, 2016, 62-80. Abstract: In 1581, Philippe de Monte, chapel master of Emperor Rudolf II and one of the leading composers of the time, dedicated his first book of spiritual madrigals to the newly elected Superior-General of the Society of Jesus, Claudio Acquaviva. In the dedication letter, he mentioned having received the Italian texts he set to music from a young Jesuit, a former pupil of his in the Imperial chapel. Starting from here, and travelling through Rome, Florence, Vienna, Munich, and Prague, I will show how the Jesuits and their networks played a crucial role in the production and dissemination of devotional music across Catholic Europe in the late sixteenth century. In this discussion, some distinctive traits of the Jesuits’ way of proceeding will become apparent: the international and cosmopolitan nature of their networks; their eagerness to test and adapt pastoral methods in different locales; and their ability to handle and experiment with a diverse range of cultural artifacts (in this case, from simple catechetical songs to the highest genres of contemporary poetry and music). A sound doctrine. Early modern Jesuits and the singing of the catechism, in «Early Music History», 34, 1-43. Abstract: The musical activities connected with the teaching of Christian doctrine in the early modern era have failed to attract substantial scholarly attention. In fact, the noteworthy and by no means obvious association between singing and catechism is a longue durée phenomenon, and one of the most ubiquitous and characteristic elements of Catholic sonic cultures in the period 1550–1800. Interconnected as these practices are with many different aspects of early modern culture, their study raises questions and offers insights not only on musical issues, but on problems of interdisciplinary relevance. The present essay discusses their role in the pastoral work of early modern Jesuits and, conversely, the role of the Society of Jesus in the development of this tradition. 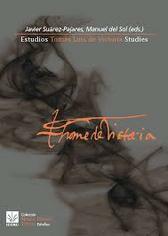 Three different phases are examined: the export of the method from Spain to Italy in the sixteenth century; its adaptation to the French environment in the early seventeenth century; its further development in the golden age of popular missions. Carlo Borromeo and Tomas Luis de Victoria: a gift, two letters and a recruiting campaign , in «Early Music», 43/1, 2015, 37-51. Click here for free access. Abstract: Tomás Luis de Victoria and Cardinal Carlo Borromeo probably never met in person. In 1583–4, however, they were in contact by letters (now preserved in the Biblioteca Ambrosiana, Milan) and through intermediaries. This article explores the circumstances of this meeting-at-a-distance between the two men, showing that it was rooted in a complex web of relationships, notably involving the Roman milieu of Filippo Neri’s Oratory. Contact began with Victoria sending music books in December 1583, part of his ongoing marketing campaign. It was maintained through Borromeo’s plenipotentiary in Rome, Cesare Speciano, and continued during 1584, when the cardinal sought a new organist for the Duomo and consulted Victoria as a trusted advisor. Borromeo died in November 1584. This case study sheds new light on Victoria’s publishing efforts of the 1580s and on his carefully planned schemes for distributing his music. At the same time, it provides new information about Borromeo’s interest in liturgical music and his strategies for the recruitment of musicians. More generally, it suggests that the figure of Borromeo, so extraordinarily prominent in the history of early modern Catholicism, needs to be analysed and interpreted by musicologists in new ways; his correspondence, the significance of which as a source for music history still has to be fully explored, will surely be valuable in this effort. Carlo Borromeo e la musica, “a lui naturalmente grata”, in Atti del Congresso Internazionale di Musica Sacra (Roma, 26 maggio - 1 giugno 2011), ed. by Antonio Addamiano e Francesco Luisi, 3 vols., Libreria Editrice Vaticana, Città del Vaticano, 2: 665-676. English abstract: When the name Carlo Borromeo turns up in musicological contexts, it is invariably associated either with the ‘textual intelligibility’ issue (the Cardinals’ Commission, Vincenzo Ruffo, etc.) or with the liturgical repercussions of the reforms he carried out in Milan (the disciplining of church musicians and the clergy, the revision of the Ambrosian rite, and so on). This stereotyped view has obscured many other aspects of Borromeo’s experience of music. Following clues contained in recent interdisciplinary literature on the Milanese scene, and browsing through Carlo’s early biographies and other documents, one can gain a much more vivid and accurate picture of the future saint’s ‘sonic life’. His music therapy sessions as a (worn out) student in Pavia, the musical homages he received during his life and after his death, the impressive details on the soundscape of Borromean Milan given by his biographers, all suggest that the relation between this key figure of the Italian Cinquecento and the musical civilization of his time was rich and complex, well beyond the clichés, and that it deserves to be studied with fresh interest. Italian abstract: «Carlo Borromeo e la musica»… Ancora? Un argomento del genere rischia di essere liquidato con un’alzata di sopracciglio. Il Concilio tridentino e la commissione cardinalizia, Vincenzo Ruffo, l’intelligibilità delle parole, l’inasprimento delle norme disciplinari per i cantori e il clero, la valorizzazione della liturgia ambrosiana: temi già trattati più e più volte, seppur non certo esauriti. Ma perché insistere? Perché, rileggendo documenti e biografie antiche e compulsando la letteratura interdisciplinare, ci si imbatte in aspetti cui finora i musicologi hanno prestato poca attenzione. Alla «vita sonora» di Carlo Borromeo si aggiungono così tasselli insospettati, e il rapporto fra la sua figura e la civiltà musicale del Cinquecento inizia a ritrovare, lontano dai cliché, tutta la sua complessità e ricchezza. Formal design and sonic architecture in the motet around 1570. Palestrina and Victoria, in Estudios. Tomás Luis de Victoria. Studies, ed. by Javier Suárez-Pajares and Manuel del Sol, Instituto Complutense de Ciencias Musicales, Madrid, 2013, 163-198. Abstract: Tomás Luis de Victoria’s and Giovanni Pierluigi da Palestrina’s motets are surprisingly understudied. On the other hand, recent analytical comparisons have clearly (and intriguingly) demonstrated that Victoria knew Palestrina’s music, reworked it, modelled his own works on it in different ways and in different phases of his career, but most notably in his first published collection of 1572. Thus, the aim of the article is twofold: to study Palestrina’s motets published before 1572 and Victoria’s motets of the same year focusing on formal design and sonic architecture; and to shed new light on the compositional relationship between the two masters. Palestrina’s Motecta festorum totius anni (1563), Liber primus motettorum (1569), Motettorum … liber secundus (1572), and Victoria’s Motecta (1572) are taken into consideration. Issues of imitatio and originality, the problem of form in the motet, and questions regarding the definition of sonic styles in late sixteenth-century polyphony are discussed. The results of this analytical survey confirm Palestrina’s role as a ‘great inspirer’, and at the same time show that Victoria, while setting up an enduring compositional dialogue with his senior colleague, used and developed his own, highly individual voice. 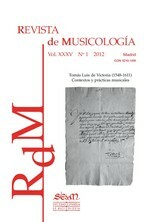 Sonic Styles in the Music of Victoria, in «Revista de Musicología», XXXV/1, monographic issue on Tomás Luis de Victoria, 2012 (but 2013), 155-182. Abstract: «Palestrina was simply a great bureaucrat of counterpoint», according to Igor Stravinsky’s famous boutade of 1960. More than fifty years have passed, but to judge from generic discussions of form in Renaissance music, and particularly in «free» genres like the motet, it seems that this kind of prejudice still exists. And not against Palestrina alone. Sixteenth-century composers are seen like automatic music machines: you feed text into the machine, and beautifully woven segments of counterpoint come out on the other side. End of the text, end of the piece, and that’s it. Adherence to the text, additive form, and varietas seem to be the only working concepts. We tend to underestimate the composers’ interest in the problem of form, and especially of perceivable form, and the creative efforts they made in this direction. But the compositional reality challenges our historical clichés. To speak of variety or kaleidoscopic multiplicity is not enough: deliberate formal strategies are at work in this repertoire, and a phenomenological approach can help to describe and understand them. Even though today analysis seems to be out of fashion, to the advantage of contextual studies, I contend that we need to start again to analyse the works of composers such as Palestrina and Victoria: and if we want to do that, we should give up monofactorial analysis, and examine multifactorial interactions and constellations of parameters, on the different levels of the compositional project. In this article, I will try to demonstrate how the definition and identification of different «sonic styles» can provide a flexible and efficient tool for the analysis of Victoria’s music, and of late sixteenth-century music in general. Text, Form, and Style in Franchino Gaffurio’s Motets, in The Motet around 1500. On the Relationship between Imitation and Text Treatment?, ed. by Thomas Schmidt-Beste, Brepols, Turnhout, 2012, 383-410. Abstract: The repertoire of Milanese Motetti missales has often aroused interest among scholars from an historical point of view, while there are surprisingly few analytical investigations concerning this corpus. The case of Franchino Gaffurio (1451-1522), surely one of the most prominent figures of the Milanese scene, is particularly striking: paradoxically, the importance of his contributions as a theorist and author of treatises has almost completely obscured his role as a composer. This article presents a first attempt to delineate Gaffurio’s motet style. Some of his motets in Librone 1 of the Veneranda Fabbrica are considered, examining the texts he choose to set, and giving special attention to the formal solutions he adopted, as well as to issues of intertextuality pointing both inside and outside his oeuvre (Ockeghem, Josquin). A number of questions concerning both the Gattungsgeschichte of the motet and the personal style of the first native Italian composer of the Renaissance are pondered. Italia. Tserkovnaya muzyka: XVI v. [Italy - Sacred music: The Sixteenth century], in Pravoslavnaja Enciklopedija, Moskva, Tserkovno-nauchnyi tesentr “Pravoslavnaya entsiklopediya”, vol. 28, 2012, 319-322. 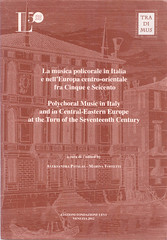 Rome, Madrid, Warsaw: Polychorality and Sonic Creativity in the Music of Tomás Luis de Victoria and Giovanni Francesco Anerio, in Polychoral Music in Italy and in Central-Eastern Europe at the Turn of the Seventeenth Century, ed. by Aleksandra Patalas and Marina Toffetti, Fondazione Levi, Venezia, 2012 (TRA.DI.MUS., Studi e monografie, 1), 229-280. _Abstract: In spite of the contributions of important composers like Palestrina, Victoria and many others, Roman polychoral music is still much less widely known than Venetian polychorality. In fact, the study of this repertoire often leads to surprising discoveries and raises questions at different levels. This article explores Roman polychorality by looking at two examples of its European dissemination: the works published by Tomás Luis de Victoria in Madrid in 1600, about fifteen years after his departure from Rome, and the masses composed by Giovanni Francesco Anerio for the court of Sigismund III inWarsaw (circa 1624-1630). In his collection of 1600, Victoria displays a vast variety of polychoral styles: the composer shows a penchant for sonic contrast, created especially by means of the polar opposition between imitative writing for reduced scoring and homorhythmic-antiphonal tutti sections. Despite later date, Anerio’s Polish masses (Missa Constantia for three choirs + b.c., Missa Pulchra es for two choirs) contain fewer sonic contrasts. Contrapuntal practices innervate his writing, and he clearly holds to the basic principles of Palestrinian polychoral style. The Master and the Soundscape. Palestrina and the Musical Image of Rome Between the Sixteenth and Seventeenth Centuries, in Early Modern Rome. 1341-1667, ed. by Portia Prebys, Association of American College & University Programs in Italy - Edisai, Ferrara, 2011, 502-509. _Abstract: Cinquecento Rome was the cradle of one of the most influential syntheses of Western music, the one that is usually labeled with the name of Giovanni Pierluigi da Palestrina. In the following centuries, this synthesis – no matter if misinterpreted or subjectively reshaped – would become a myth. How did this peculiar and multifaceted formulation of a paneuropean polyphonic style come into being? What kind of influences turned a chapelmaster of provincial origins into the supreme arbiter of Roman musical style? This paper explores from a broad perspective the confluence of international and local musical trends towards Rome during the Sixteenth century, and the subsequent global dissemination of the new Roman music. And since music was a crucial factor in city life, it also address the unmistakable coincidence of this process with the powerful renewal of “l’image de Rome” (Labrot) in the post-Tridentine era, trying to capture the evolving soundscape corresponding to this image. Earthly Music, Interior Hearing, and Celestial Harmonies. Philippe de Monte’s First Book of Spiritual Madrigals (1581), in «Journal of the Alamire Foundation», 3/2, 2011, 208-234. Abstract: This article examines Philippe de Monte’s first book of spiritual madrigals, underlining the pioneering character of this collection in the history of the genre and its relationships with the Jesuits. Two new text attributions, to Vittoria Colonna and Laura Battiferri, are discussed within an overall description of the book, its themes, and its structure. Three madrigals dealing with spiritual themes in terms of musical metaphors and imagery are analyzed in the context of sixteenth-century ideas on music and Christian spirituality, and as an open reflection by Monte on the real value of music beyond the ephemeral appreciation of human judgement. Quale Roma al Nord? L’immagine musicale di Roma nel primo Seicento a partire dal caso di G.F. Anerio, in Musikstadt Rom. Geschichte – Forschung – Perspektiven. Beiträge der Tagung »Rom – Die Ewige Stadt im Brennpunkt der aktuellen musikwissenschaftlichen Forschung« am Deutschen Historischen Institut in Rom, 28.–30. September 2004, hrsg. von Markus Engelhardt, Kassel u.s.w., Bärenreiter-Verlag 2011 («Analecta musicologica», 45), 120-131.